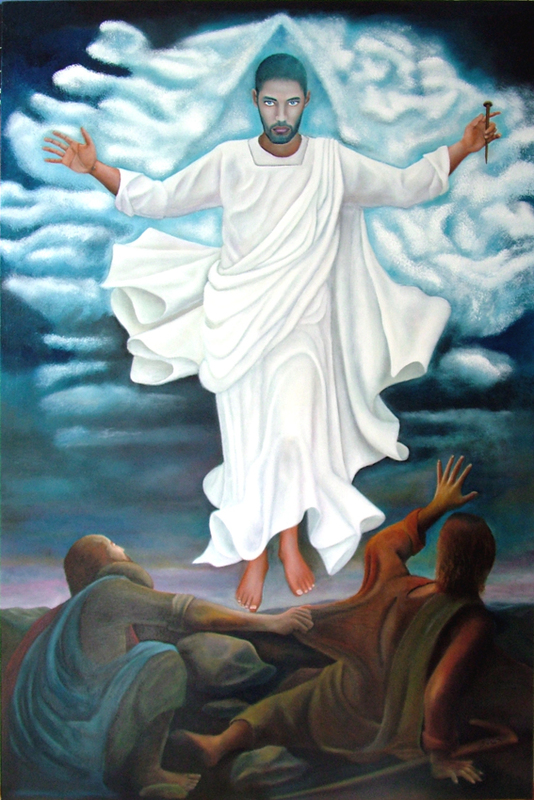 In this painting I represented the Transfiguration, giving a new look to Christ, more modern, relevant, contemporary, with the lineaments of a man with no nationality, who represents all men, citizens of the world. I have thus represented the three disciples in different attitudes: who is careful observer in prayer; another is afraid and tries to find comfort in everything that surrounds and unwittingly, he rips the dress of his neighbor. The third witness, finally, tries to protect her eyes from strong light, emanating from dress of Christ. The Jesus with his arms in a position of crucifixion and a hole in his right wrist, clutching a nail with your other hand…makes explicit the message and what will be the course of events, its destiny, undoubtedly none. His robes, are white and pure, like his mind.